Living with anxiety is extremely uncomfortable for thousands of people who have to deal with the challenges on a daily basis. The effects of the issue don’t just go away when they bed down for the night and try to get some rest all ready for the next day either. Researchers and scientists alike are constantly working on ways to locate the precise source of what causes people’s problems with anxiety, but the good thing is that while they’re continuing to find the root and how to overcome it for all, there is at least some sort of help at hand. As it stands, most psychologists agree that the issue stems from a mixture of both your personal history. 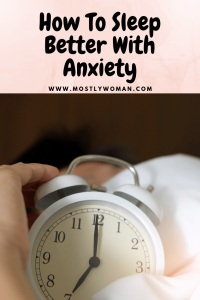 If you want to sleep better with anxiety, then you can follow these simple, but proven-to-be-effective tips that we have here for you. Okay, so this is what we’re here for, but the reason we want to reiterate this point is that not receiving ample sleep on a regular basis can further increase the symptoms of anxiety, creating a vicious to a fro when bad sleep brings on more intense anxiety and vice versa. You need to analyze the way in which you can make everything easier at night-time when you need to be getting your rest. This is the key; keep it simple and try to avoid overthinking, because people with anxiety tend to naturally do this. Poor sleep and associated pain can cause irritable behavior. Take a look at these 5 ways to get rid of neck pain caused by stress and anxiety to help with this and if you remember to remind yourself how sleep is top of the tree in terms of helping to outlast anxiety, you’ll be on to a winner. A really effective way to approach beating feelings of anxiety, both at day and night is to adopt night-time meditation techniques. 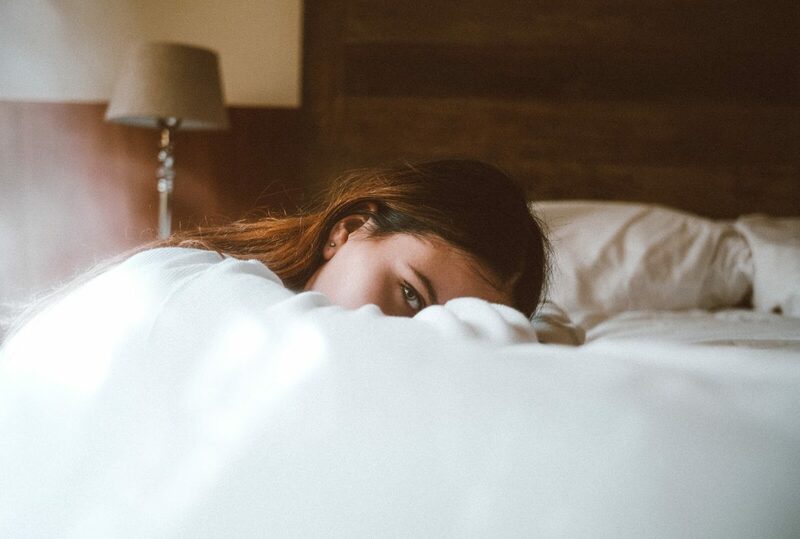 If you take some time, even if it’s 3-5 minutes in the morning and then the same again in the evening to do some mindfulness, this will help you to feel less pressure in regard to your anxiety and get better-quality sleep. You can learn some really easy techniques that have been shown to help issues surrounding anxiety, and you can continue them for the rest of your life to assist with other things such as focus, relaxation, mood, and clarity too! Spending large volumes of your time on social media is a proven way to affect your mental well-being. When you go to bed, it’s a regular occurrence to lie there and scroll away for endless amounts of time, but this really is a bad thing to do. Not only does social media create the perception that everyone is having a better time than you (which worsens anxiety for some people), research has found that people who over-indulge when it comes to social media are three times more likely to suffer from depression! Staring at smart screens also stimulates your brain at the worst time when it should be winding down for sleep, it prevents the melatonin release in the brain that helps you find natural slumber too. Give yourself a two-hour window from turning off your screens, TVs included, and going to bed. The Anxiety and Depression Association of America state that being physically active provides people with a tried and tested method of alleviating anxiety. It can help you to become more comfortable in social situations too. Furthermore, if your mind and body are kept busy with exercise, you’re less likely to be on social media or worrying about things because you’ll be focused on your activity. In spite of the vast evidence out there that is readily available to see that highlights the dangers of smoking, people still continue to reach for the cigarettes, particularly when they are in stressful situations or feeling anxious. The Mental Health Foundation state that smoking, does, in fact, heighten anxiety levels for people who have issues with anxiousness, so when many try and subdue the feelings they’re having, they only make them worse! The same can be said for caffeine too. while it’s not as dangerous to your health, caffeine too close to bedtime can prevent good sleep and keep you up gazing at the walls as you try to drift off at night. The solution here is to stop smoking and caffeine intake altogether; but if you aren’t at this stage yet, you should look to have a cut-off point of around 3 pm each day, giving your body enough time to expel what you’ve ingested. If you’re finding it hard to deal with your anxiety, seek professional advice. Suffering alone is not the answer and there are lots of people who are ready to help you get the assistance you need to overcome and move on. This is a guest post from Sarah Cummings a freelance writer and editor in chief for The Sleep Advisor. Thank you Sarah for these great tips.